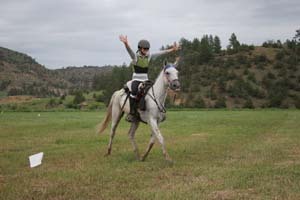 It's a labor of love to put on a 2-day ride like the Fort Howes endurance rides - especially when they are AERC and FEI. When you're a ride manager, and especially when you're putting on FEI rides, you are risking financial loss, and you're guaranteed a belly-ache of paperwork: "Sign this" "Give us your credit card number for that" "We need your blood for this" "Please sacrifice your firstborn for that" and various other offerings you'll be required to make. Sometimes the hoops you have to jump through are so great that ride managers feel it is no longer worth it to do both AERC and FEI. 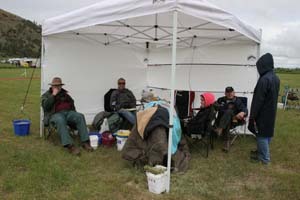 But Jan and Bill Stevens have been laboring, and loving putting on the Fort Howes endurance rides, since 1997, and they managed once again to put on a fairly relaxed, and quite enjoyable weekend of rides, even though the weather forecast was, like last year, not looking so good. Temperatures wouldn't be quite as low (as in "chance of snow"), but there was a good "chance of rain" predicted for the rides on Saturday and Sunday, and it did dump over an inch of rain Thursday night. However, as the locals say, if you don't like the weather in Montana, wait 5 minutes and it will change. Just come prepared for any kind of weather (shorts, winter wool and fleece clothing, muck boots) and you'll be able to handle it. And as soon as the sun comes out and the wind picks up, the mud will quickly start to dry out. 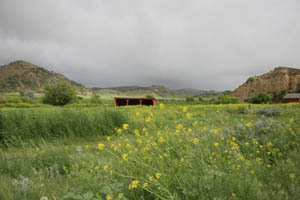 Held on the Stevens' Circle Bar Ranch in lush green rolling hills of southeast Montana, which has been in the family for 6 generations, a lush hip-high-grass meadow is sacrificed for the ride basecamp. "It's just a winter pasture," says Jan, but most horses would kill for a pasture like that. If it rains - and it will rain - cars and trailers will shred the pasture to bits, especially when they take a Big Truck or tractor to tow them out during or after the ride. The pasture actually recovers over the summer so the cows stay happy in the winter. Attendance was down by about a third this year, probably because the selection trails for the WEG in Kentucky this year began in 6 days. Despite that, about half the riders on Day 1 were riding FEI. And while you could see some good Arabians that are actually qualified for the WEG, and some top US riders that are qualified for the WEG, you could also see a breed of horse you've probably never seen and may not have heard of, and a couple of riders you've never seen on an endurance course before. 50 on a gaited horse breed called a Montana Travler. I thought that Dave Warwood, the cowboy with the big mustache, was pulling my leg when he rode by and said that was what he was riding. (I'd guessed it was a Tennessee Walker). In fact, the Montana Travler - a cross between a Tennessee Walker, American Saddlebred, Morgan, Thoroughbred, and Hamiltonian - is a gaited horse breed developed in the 1930's through 1970's by Tom Eaton. The Montana Travler that Craig rode, Company, was pulled for lameness, but Dave's horse Misery (I'm not making that up!) 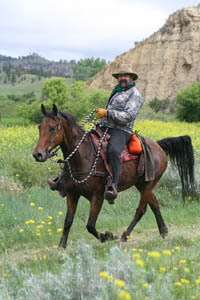 finished turtle on the 50, making him the first recorded Montana Travler to compete in endurance. Dave later said "Our horses are fit, because they work in the mountains, but they weren't quite ready for this!" Chance of rain during the day was 60%, and the clouds were heavy from Friday on, but it held off till Saturday at 2 PM... at which time the rain gear and the muck boots came out. The temperature didn't drop below 50 till evening though, so it was decent riding for the horses. Except for the trail which began to get slick. Cici Butler-Stasiuk finished third today on DJB Montyonthespot (on which Cici finished 3rd in the FITS 100 in Florida on March 6) - on the LD! With 11,000 miles and title of National Endurance Champion 4 times (2 50's and 2 100's - she won the National Championship 100 here at Fort Howes in 2005) under her belt, I had to ask: "When was the last time you rode an LD?" "Oh, maybe when I was 7!" (Or, possibly, never.) She accompanied Remy Hallam on DJB Cytron Kon JMF (on which Cici won the 100-mile Gallop on the Greenway on January 30 - both are WEG qualified horses). That didn't stop Cici from being thoroughly pleased and excited to accept a bucket for her ride award that night. Remy Hallam was pretty happy too. Linda Fisher of Kenlyn Arabians rode Kenlyn Elusion on his fourth LD. "I just got my 20,000 miles. I don't have to ride a 50 anymore if I don't want to!" 14 of 16 starters completed the LD. The turtle, Karen Cox, finished just before the rain started. Karen has a great recap of her weekend here. 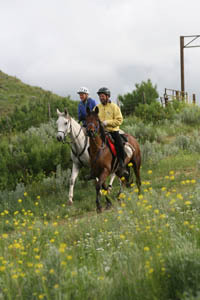 Cody Boysen and MD Maverick galloped out to the lead on the 50 miler. Cody stayed in front until his horse vetted out lame after loop 2 - and that left Columbian Gregory Smetek on Ivanov the winner. Gregory keeps his horses in training with Roxy Welling; this was Ivanov's first 50. Roxy finished 3rd in the 50 on Pablo. She and Colleen Devry and Sue Hedgecock had a little race-off over the last 50 yards to the finish. Colleen finished second on Nightwind's Indigo Bey; Sue and Amazing Kon were pulled lame at the finish. "I know I shouldn't have raced at the finish," Sue said later. "But - it was fun! I felt like a 10-year-old kid. I couldn't help it!" Colleen agreed - sometimes that little kid just takes over the reins and spurs you on, and you just have to let her do that! 21 of 28 horses finished the 50. 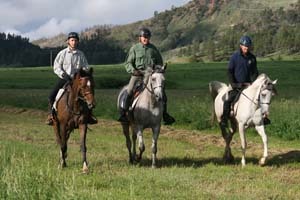 Jeremy Reynolds and TA Tiran, and Tennessee Mahoney and DWA Khyber (riding her own horse this time! - Tennessee travels around a lot, riding a lot of horses) led on the first loop of the 75. Jeremy and Tiran had last won and BC'd at the Shine and Shine Only 75 miler in May. Tennessee's horse took a while to come down at the first vet check, so she backed off the front pace, and ended up finishing 5th. 11 of 16 horses finished the 75. During the day riders from different distances went in and out of camp on different loops, ATVs and jeeps zipped around checking on the trails and the riders, and rain showers kept skirting camp (until 2 PM). I had a feeling Bill Stevens was secretly hoping for a little bit of rain so he could go 4-wheeling in the mud. Anne Pfieffer was also zipping back and forth to basecamp in her little truck laden with goodies she'd been cooking for several days before the ride. Anne is a retired schoolteacher from Texas, and she once had her sights set on officiating at FEI rides. "But when that fell through, I sort of stumbled into this catering at rides - and I love it. I found my niche!" You can expect everything from chocolate covered strawberries made to look like animals, beef stroganoff, fruit and nuts, to smoothies (when, say, it's 90* - the blender didn't come out here!) and hot chocolate, when your bones are cold and you don't think you can stand outside one more minute without something warm in your hands and your belly. Anne and her treats have become a fixture at some of the FEI rides here and abroad. One of the volunteers for the day was the new Forest Service District Ranger. 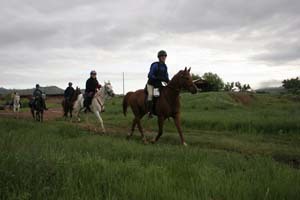 Claude came out to see an endurance ride, and he was put right to work, out timing one day, and in timing the next. He didn't complain too much. He rides horses (in fact, he fell off his horse on his first day on the district!) but nothing like endurance. The pouring rain didn't stop the barbecue - the big fire-y grill was moved inside the big tent and would have smoked people out, but everybody stayed to eat the possibly home grown steaks, the green beans and potatoes, the fritters and home-grown honey. 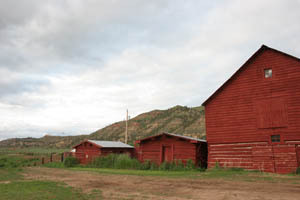 The weather finally cleared up at 7:30 PM, just when the last two 75 milers were heading out on their last 15-mile loop. Day 2 was supposed to have less rain... but this is Montana, you know. Twenty 100's and 4 75's started on the trail at 5:00 AM, just as it was getting light. The sun came out for a while and a couple of friends of the Stevens fired up a grill and cooked breakfast sandwiches for whoever wanted them. "Before today," said one of the cooks, "the closest I'd been to a horse was when I was sitting in Bill and Jan's kitchen and a horse walked by the window." They had a good time as did everyone who had a happy sandwich (or two). Going just 4 miles before turing around on the 100 was Canadian Elroy Karius - he felt A Salisbury Rose wasn't moving right, and was possibly going to tie up. She was treated back in camp as a precaution, but she had no problems afterwards - Elroy had quit on her early enough as to cause no harm. More bad luck fell to Namibian rider Kordula Voigts. Needing one more FEI starred ride to qualify for the WEG, Kordula was pulled for lameness yesterday on DJB Mistical Image on the 75, and again today on DJB K De Cielo on the 100. That left Kordula with only a last ditch attempt to possibly qualify at a ride in Canada July 1 - or in Namibia on the same weekend. Her decision would also be influenced by her fellow Namibian riders Olivia Mattaei and Anna Wucher riding the 100. 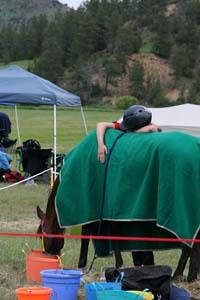 They too had bad luck - Olivia's horse fell on her on the first loop - Olivia injured her elbow, and her horse was lame. Olivia had 8 months between high school graduation in Namibia and physical therapy school in Germany, so she came to Darolyn's place to ride her horses, and she loves it. Anna Wucher made it more than halfway before her horse DJB Tessarah was pulled for lameness. Meanwhile, another Columbian (living in the US) was getting closer to the leader Cici Butler and DJB KD Fantasia in the 100. Hernan Barbosa was one of a trio of East Coast invaders. Riding Trident, one of Steve Rojek's horses, Hernan rode with Steve on Beaujolais and 20-year-old Kyle Gibbon on Steve's horse Julio for a few loops, before leaving them behind. "This is a nice horse!" Hernan said of Trident. He doesn't own a horse himself, just rides Steve's horses. "Steve has nice horses. I don't want to ride anybody else's horses." The East Coast invaders had in fact come to Fort Howes many years in a row, only missing last year's snowy renewal. "We weren't too disappointed about that!" Steve said. Yet another Columbian was riding up front with Cici for a while: Mauricio Gaitan on Autumn N Motion, trained by Roxy Welling. Mauricio and Autumn had finished top ten in a 55, 75, and 100 the last 5 months. Yesterday's winner, Columbian Gregory Smetek was sort of helping Hernan and others in the crew area - he was very clean and could be seen holding a leadrope by thumb and one finger. "Today I don't want to get dirty. Today I am visiting!" Mauricio's horse was pulled for lameness after loop 5, leaving Cici with a distinct lead. Trish Dowling and ZF Mocha got pulled at the same vet check, which left Doug Swingley and Nash in second, and Ona Lawrence and CR Mackie's in third. Doug Swingley had his hands full on the 100 with National Security. Nash finished the 50 here last year in 2nd place with Sue Hedgecock for owner Jeff Stuart. Doug later traded Jeff another horse for Nash. Nash had some high, fast opinions of himself in this 100 miler. "He's a monster!" Doug said. "He's used to that 13 mph Qualified canter, and when I ask him to trot where it gets muddy he doesn't want any part of that!" Doug was wrestling with him through the first couple of vet checks. After Loop 4, he asked Bill Stevens, "Are you ready to ride him? My arms are getting tired!" After 11 hours and four minutes of riding, Cici Butler-Stasiuk and DJB KD Fantasia crossed the finish line first. Cici looked like she'd won her first ride ever. That's one thing about Cici - she is so enthusiastic about endurance riding, whether she finishes first in a 100 or 3rd in an LD, whether she gets a horse blanket for winning, or a sponge for completing. She's always smiling infectiously big on a horse, whether she's in the lead or back in the pack, having a good time. It's wonderful to see anyone having such a good time and enjoying the little things about the sport while competing on the big end. Doug Swingley and Nash finished third. Doug was six minutes late going out on his last loop because he was putting a shoe on someone else's horse. No big deal. They still finished in COC (Certificate of Capability) time, of under 12 hours 18 minutes. As they walked back to their trailer after their completion, Doug asked Jan Stevens, "Do you have another 100 he could do tomorrow?" Finishing 6 minutes behind Doug were Steve Rojek on Beaujolais and Kyle Gibbon on Julio. Kyle and Julio got Best Condition, their second BC together on a 100. They won and BC'd at the Far Out Forest 100 in February. There were a couple of firsts on the 100: Marcia Hefker and her 11-year-old son Cy Brower and their horses all completed their first 100. From Raton, New Mexico, friends told them that Fort Howes was an easy 100 to do. There were a few chuckles at the awards over that. Fort Howes isn't very difficult, but you wouldn't call it very easy, either, especially when it gets muddy and you have weather to contend with. They finished 9th and 10th, only having to ride the last half hour in the dark... "But it was very dark out there!" Marcia said. I asked Cy the next morning if he'd had fun. "It was OK." Would he do another 100? "Not any time soon." 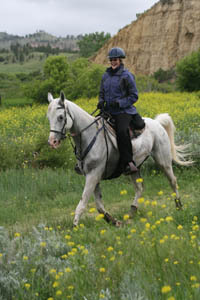 Terri Rashid, and her horse Keen Sweep, who finished 11th, also completed their first 100s. Her husband and two young boys helped crew. They were eyeing Cy Brower when he picked up his completion awards. Maybe there will be a couple more juniors doing the 100 next year with mom. Doug Swingley got a big cheer at the awards when, at the chanting of the audience, "PINK! PINK!" he picked a hot pink halter and leadrope as his top ten award. 12 of 20 horses finished the 100. Also getting a big cheer was junior Joe Haeberle from Wyoming, who finished his second day in a row on his horse Scooter, in the 55. He was also excited to pick up his awards - so refreshing, again, to see someone who is excited about endurance riding and enjoys completing and being acknowledged with applause and a ride Tshirt. 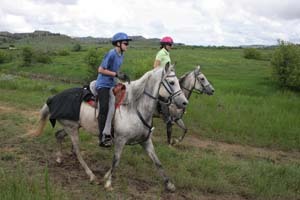 Joe is 15 and started riding endurance 3 years ago. He loves his horse Scooter. "We got him for $30 off a rancher! He's a cool horse!" Joe came to the ride with Ronnie and Bonnie. Bonnie Swiatek had been riding endurance for 12 years - and today was her first 55. She finished 5th on BRA Surprise Skylark (they finished the LD on Day 1), and she finished first Heavyweight, and came away with an armload of awards and a big round of applause. 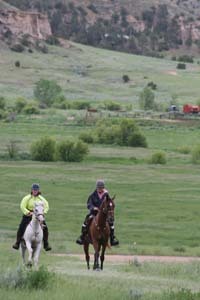 Winners of the 55 mile ride were Lynn Lee on Tazzeto and Suzy Hayes on RS Silverado. They trailered down together, rode together, and finished first together. Silverado had last finished second in the 50 at Mt Adams in May. He'd had some trouble with his glue-on Easyboots in April at the Git R Done ride - they'd had a little gap in the seal, where sand got in and rubbed a heel sore. Today the boots and the horse were a success. Suzy was another who was very happy when her horse passed his final vet check - she had hugs all around for everybody and a big smile. 19,000 endurance miles, and another person who still enjoys it and gets excited about finishing a 55 mile ride. 10 of 13 horses finished the 55. 4 started the 75, and 4 finished, with Cody Boysen and GDE Sweete Legacy winning by 1 1/2 hours over Leanna Marchant on Samsons Fire, and Kathy Irvine on Nightwind's Savannah, who rode the entire ride and finished together. Bonnie Mielke and Ola Loki finished 4th - and where else but Fort Howes can you finish last on a 75 miler and get prizes for finishing, finishing Top Ten, First Middleweight, and Turtle? While there are a few definite 'right wing' and 'left wing' factions in AERC - all-FEI vs no-FEI - the Fort Howes ride is one where - especially this year - just about everybody got along and had a good time, even if they didn't finish. First timers, old timers, happy tears and cheers, good food, good awards, good trails and good horses and good riders - just good fun. It can happen. It did happen this year at Fort Howes.